We Brits are a green-fingered lot with apparently one-third of the nation spending some time each week gardening and forking out £1.5 billion a year on plants. No wonder that over 2 million of us catch Gardeners' World and over 1 million tune into Gardeners' Question Time. 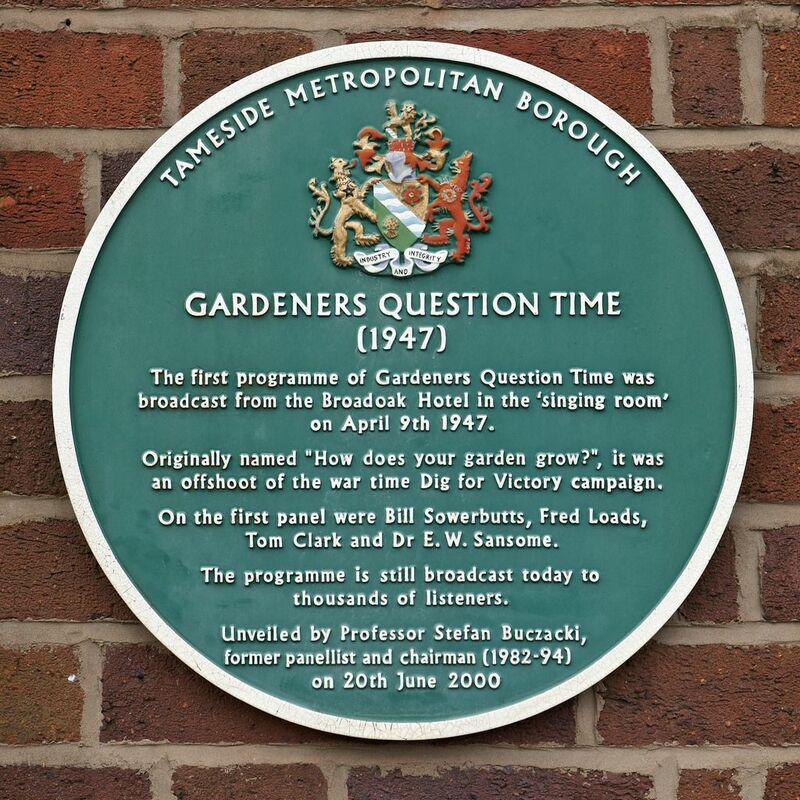 This week Gardeners' Question Time celebrates its 70th anniversary. I'll track its history shortly, but first a look at the programmes that sowed the seeds for GQT. Gardening was the subject of talk programmes in the early days of broadcasting with members of the RHS invited to give a Chat on Gardening. And it was this pastime that created one of radio's first stars in the unlikely form of Cecil Henry Middleton, who eventually came to be known to listeners as 'Mr Middleton'. He first gave talks on the BBC National Programme in 1931 under the title The Week in the Garden and by 1934 he'd become the Corporation's first gardening correspondent with his weekly In Your Garden. He was also TV's first gardener and tended the plot at Ally Pally. Mr Middleton's advice was of the much needed practical kind. "As a gardener he believed in gradualness and development, and he most of all disliked people with capricious ideas and importunate designs." In the era of tightly scripted progamming he was given some latitude by his BBC producers. One memo insisted: "There really is no need for you to submit a manuscript every time you talk, so long as you have sufficient notes and you can extemporise - I would be happy if you would endeavour to tell and not read your garden talks." A typical talk might have gone something like this: "Good afternoon, Well it's not much of a day for gardening is it? You know, we hear a lot of so-called witty remarks about the poor old humble cabbage. But how we should miss it if we hadn't go it." Mr Middleton was a key figure in the wartime Dig for Victory campaign, wrote a number of books and had a regular column in the Daily Express. His influence would have extended beyond the war had he not died suddenly in September 1945, the Times obituary noting that his name was a "household word". Despite the death of Mr Middleton In Your Garden continued to inform listeners about their allotments and herbaceous borders for another five years with various presenters that included Roy Hay, Fred Streeter and Eric Hobbis. Although now largely overlooked horticultural journalist Roy Hay enjoyed a lengthy broadcasting career. When In Your Garden ended in 1950 he became the main presenter of its Sunday afternoon replacement Home Grown that was heard on the London Home Service and some other regions. Home Grown ran until 1957 by which time Gardeners' Question Time was heard nationally. 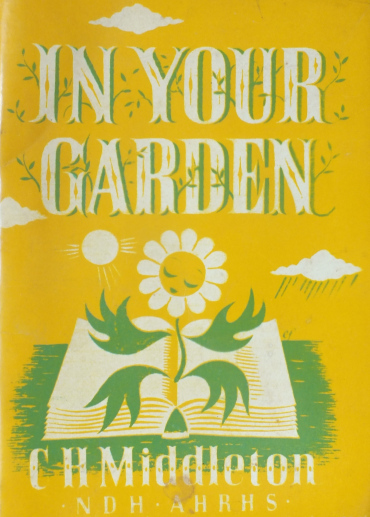 In 1957 the BBC resurrected the In Your Garden title for a weekly magazine show that Roy presented firstly on Network Three (as part of their lifestyle and learning slot sandwiched between the Music Programme and the Third Programme) until 1964 when it transferred to the Home Service (1964-67) and then Radio 4 (1967-1970). It was only finally dropped in March 1970 by network controller Tony Whitby following the Broadcasting in the Seventies schedule shake-up as he only had room for one gardening programme. In Your Garden was regarded as the more "serious professional affair" but its audience was only 200,000 as against GQT's one million or so. As the Home Service regions enjoyed a degree of autonomy in the 1940s and 1950s not all of the UK heard In Your Garden and Home Grown. Listeners in Scotland, for example, would for many years tune into The Scottish Garden as their regional alternative. But it was the North of England (and for a while by default, due to transmitter restrictions, Northern Ireland) that first heard British radio's longest running gardening show. How Does Your Garden Grow? was the brainwave of Manchester-based talks producer Robert Stead. The first show was broadcast in the North on 9 April 1947 and had been recorded before members of the Smallshaw Allotment Association in Ashton-under-Lyme. 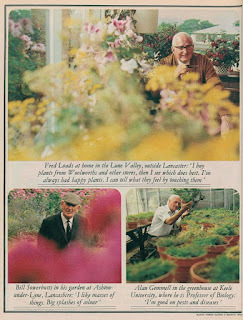 Robert chaired the series that, for that first edition, included two gardeners who would become long-standing experts: local lad Bill Sowerbutts (always billed as "... of Ashton-under-Lyme) and Fred Loads ("of Burnley", later "of Lancaster") alongside Tom Clark and Dr E.W. Sansome. The first question was put by the chairman of the association, Mr Hopwood - about the merits of double digging in an area with wet soil - and the second by his wife. Apparently an 81-year old man in the audience was under the impression he was at a recording of Have A Go and insisted on playing the cornet. This is the first edition of How Does Your Garden Grow? How Does Your Garden Grow? eventually became Gardeners' Question Time in 1951 and continued in the North only until 1957 visiting a different village hall or meeting room each week. Joining the panel in 1950 was Professor Alan Gemmell ("of Keele University") and together with Sowerbutts and Loads they became the mainstay of gardening advice for the next three decades. "All three men loved to banter, to try to out-persuade the audience with their recommendations for what to do with unresponsive aspidistras or rampant Russian vines". The triumvirate of Sowerbutts, Loads and Gemmell hardly missed an episode but producers occasionally co-opted other panel members such as vegetable-grower supreme Arthur Billitt (Gardener's World cameras would later visit him at Clack's Farm, Worcestershire in the 70s), Eric Hobbis from the University of Bristol, Cornishman Fred Shepherd and Tom Matheson. In 1957 GQT made the transition to national coverage, firstly appearing on the Light Programme over the summer as Down the Garden Path and then from September taking root in its now traditional 2pm Sunday slot. 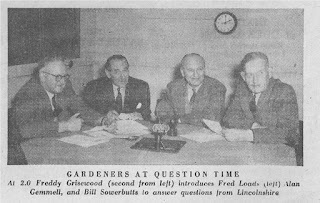 Here's an early 60s example of Gardeners' Question Time (kindly provided by Nigel Deacon) recorded at the Sanderstead Horticultural Society near Croydon. It's the regular panel of Loads, Sowerbutts and Gemmell. Of the voices you hear, Simon Elmes (author of Hello Again-Nine Decades of Radio Voices) wrote of Bill Sowerbutts that he had "an indelibly rich local accent and personality to match ... (he) had a swagger to him and his light voice with its cracking accent was a perfect match for his co-panellist, the darker and gentler voiced Fred Loads." Gemmell he describes as "a Scot with a twinkly sense of humour." This edition aired on the BBC Home Service on 16 December 1962. 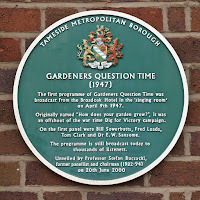 There have been ten regular chairs of Gardeners' Question Time: Robert Stead (1947-1953), Freddie Grisewood (1953-61), Franklin Engelmann (1961-72), producer Ken Ford who took over the presenting role following the sudden death of Engelmann (1972 and then again 1977-84), Michael (Nationwide) Barrett (1972-77), Les Cottingham (1984-85), Clay Jones (1985-1993), Dr Stefan Buczacki (1993-94), Eric Robson (1994- ) and Peter Gibbs (2005- ). Others who briefly filled in were Rex Alston, Steve Race Gill Pyrah and Anna Ford. 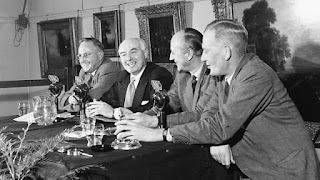 The panel always attempted to inject some humour into the proceedings but this didn't always go down well with management who seemed a little po-faced about the programme. A 1971 Review Board complained that the cast never varied and often dispensed inaccurate information. "When their inaccuracies become apparent even to themselves they fell back on music-hall jokes." David Hatch, then Network Editor in Manchester, described them as "a very elderly trio" and "a rather self-satisfied team". 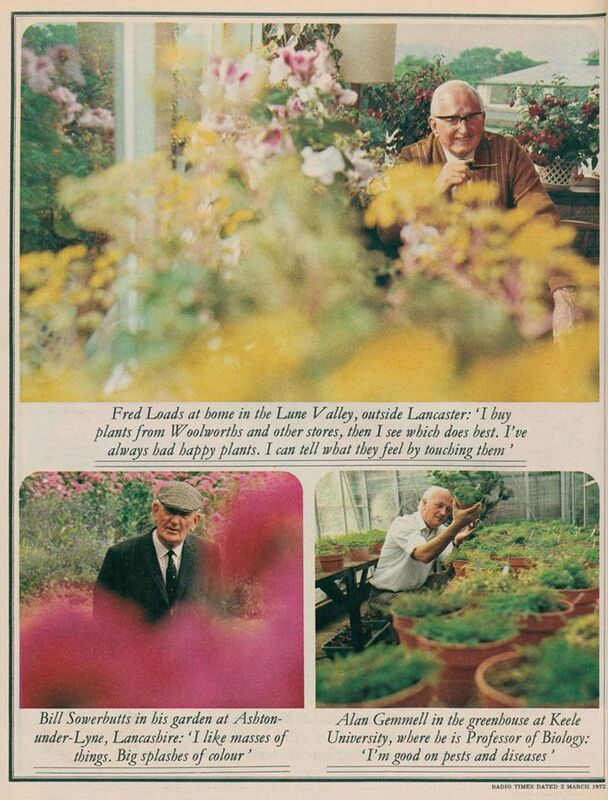 In the event nature took its course when Fred Loads died, aged 78, in 1981. With the team atmosphere at recordings having gone Alan Gemmell retired in 1982 (he died in 1986) and then Bill Sowerbutts left in 1983 (he died in 1990). By the late 70s other experts came on board, blunt Yorkshireman Geoffrey Smith, Welsh vegetable expert Clay Jones and, briefly, horticultural writer Chris Brickell. Then from 1982 the programme was given a bit of a shake-up with its first regular female expert Daphne Ledward who'd previously dispensed tips on BBC Radio Lincolnshire. Also joining to become a regular member were Dr Stefan Buczacki. and TV's Peter Seabrook, already a familiar face on Gardeners' World and Pebble Mill at One. 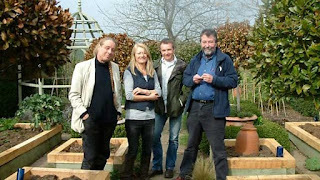 Other gardening experts appearing on the programme in the 80s, 90s and 00s include: Sid Robertson, Fred Downham, Bridget Moody, Sue Phillips, Adrienne Wild, Walter Gilmour, Don Cockman, Bob Flowerdew, Pippa Greenwood, Geoff Hamilton, John Stirland, Crosbie Cochrane, Henry Noblett, Anne Swithinbank, Chris Beardshaw, John Cushnie, Matthew Biggs, Carol Klein, Bunny Guinness, Nigel Colborn, Roy Lancaster, Tony Russell, Carole Baxter, Matthew Wilson and Christine Walkden. 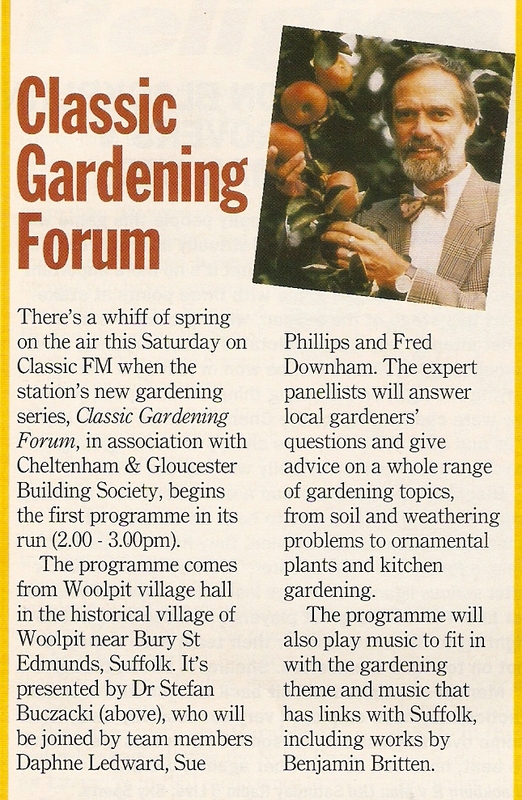 For this 40th anniversary special in April 1987 the team visited the Old Palace, Hatfield in Hertfordshire where the horticultural questions come from some surprisingly familiar names. There's Germaine Greer (who used to write a gardening column as 'Rose Blight'), Molly Weir, John Humphries, Mary Whitehouse, Johnny Morris, Julian Pettifer, Penelope Mortimer, Penelope Keith and Richard Briers. The panel are Daphne Ledward, Geoffrey Smith (who we still refer to as the 'mad axe man' as on Gardeners' World he always seemed to be advocating vigorous pruning of any shrub or tree), Fred Downham and Dr Stefan Buczacki. In 1994 there was trouble in the GQT garden, and it wasn't a case of powdery mildew or box blight but the threat of outsourcing. Radio 4 had decided that two programme, the other was Feedback, should be independently produced. Trevor Taylor, with Taylor Made Productions, won the contract. Trevor had previously worked as a BBC news reporter and producer on local radio and Radio 4 before setting up his company in 1985. However there was mutiny in the air as the existing team of Stefan Buczacki, Daphne Ledward, Fred Downham, Sue Phillips and Bridget Moody failed to secure guarantees of continuing to appear on the programme. 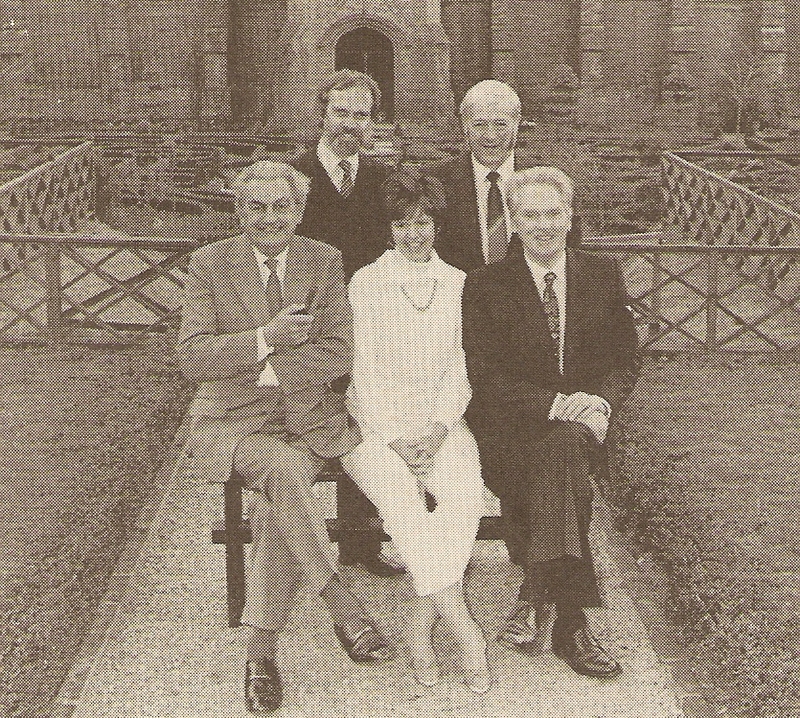 They all left the BBC and shifted across to Classic FM for an hour-long show titled Classic Gardening Forum with the question and answer sequences "blended with popular classical music to fit themes such as flowers, fruit and the regions from where the programmes are broadcast". Classic FM's version was relatively short-lived, being finally put out to grass in September 1997. The response from listeners to the changes at Radio 4 was mixed: "the programme has become complacent with some panellists promoting themselves as cult figures" one complained. "I don't believe any of the programme's followers want any changes, updates, zappy presenters, music quizzes or whatever other horrors lie in wait for us," wrote another. Listeners needn't have worried, the new chairman was Eric Robson, already known to the Radio 4 audience from File on 4, with some new experts joining the panel including Anne Swithinbank, Pippa Greenwood and Bob Flowerdew; all, at the time, familiar to viewers of Gardeners' World and all still with the programme 23 years later. Since that upset things have been relatively quiet in the garden. In December 2000 the programme gained an extra 15 minutes on its running time. In 2005 meteorologist and keen gardener Peter Gibbs joined to share the chairing duties with Eric Robson. In 2009 producer Trevor Taylor retired and the contract was awarded to Somethin' Else - the same company behind Radio 3's Essential Classics and 5 live's Kermode and Mayo's Film Review. The show still plys the highways and byways of the UK to face questions from amateur gardeners but there are also regular correspondence editions, although these are rarely studio-bound. Recent specials have been recorded at 10 Downing Street and Buckingham Palace. The gradual shift to add some new life to the programme has not been without its critics, although it's usually former chairman Stefan Buczkacki who's quoted, bemoaning the fact it "no longer offers any sense of location or identity." The basics of GQT, the dispensing a gardening advice, eventually spread to other radio stations as the BBC opened its network of local stations, with most offering some form of gardening programme or feature. Some experts have enjoyed a long tenure, Joe Maiden on Radio Leeds, who sadly died in 2015, had been with the station for 40+ years whilst Radio Nottingham's John Stirland has also been on-air for a similar amount of time. Even the early ILR stations dabbled with gardening spots with Percy Thrower appearing on LBC for instance. GQT's Daphne Ledward ('Daffers') was for many years a regular on Jimmy Young's Radio 2 show. In a similar vein Jeremy Vine occasionally calls on Rhondda Valley allotment owner Terry Walton for his tips and advice. For the programme's 70th anniversary there's a special edition this afternoon on BBC Radio 4 that gets a repeat in the time-honoured 2pm slot on Sunday afternoon. But as this weekend promises to be warm and sunny you may find yourself out in the garden deadheading those daffodils or tending your veg plot.